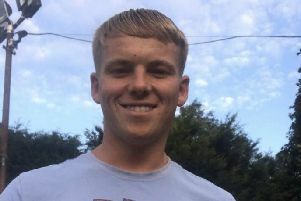 A 14-year-old boy became trapped in a barn when a firework ignited bales of hay and spread rapidly, an inquest has heard. Louis Simpson had climbed through an open window at the side of the building at Fairhurst Hall, Parbold, Lancashire, with three friends. They played inside for a hour before the other boys walked out of the front of the barn and shouted to the teenager inside that they were leaving. Preston Coroner's Court was told Louis, of Tan House Lane, Parbold, then said to them "give me a second, I want to show you something", before they heard a bang followed by flames. The alarm was raised but the blaze was very well developed and had burned through the roof by the time the first fire appliance arrived on the scene on the afternoon of November 29. His body was located more than 24 hours later in the upper level of the barn near where he had entered, after fire crews doused the blaze and, with the assistance of local farmers, individually separated and retrieved the bales as part of their investigations. The burning of 150 tonnes of hay would have felt like an oven, the hearing was told, and conditions would have been unsurvivable in less than a minute. A post-mortem examination showed the cause of death was severe burns, although Louis's parents, Andrew and Vanessa, were told he would have died very quickly. Giving evidence on Friday, Detective Chief Inspector Geoff Hurst, of Lancashire Police, said it was not unusual for children to play in the barn. He said Louis and his friends had been playing outside before deciding to go in, where they were described as "generally messing about" and jumping from one bale to another. The officer said: "After an hour, three of the boys decided to leave to go to the front of the barn and they shouted for Louis to say they were going. "Each of the boys were interviewed and they gave very similar accounts that Louis said 'give me a second, I want to show you something'. "All described hearing a bang, then seeing flames and then they ran off." He said one of the boys said they were "very scared" and that one also said he attempted to go back to the barn but the heat was too intense. Mr Hurst said the remnants of a firework were discovered close to Louis's body. No-one else was identified as possessing a firework and later police inquiries established Louis had more fireworks at home, he said. Mr Hurst said he had no concerns over the veracity and accuracy of the boys' evidence. The inquest heard Louis's mother was not satisfied about the findings and had requested further investigations. Recording a conclusion of misadventure, Coroner James Newman said: "This appears to me to be a tragic incident as boys have been playing, as boys will. "The fire has developed, and far faster than anyone expected, and it led to Louis being trapped in the barn and dying as a result of that." He said new information would have to come to light for the conclusion to be quashed. When asked if the family wished to say anything about Louis as a person, his father Andrew said: "He was an incredibly sensitive, caring and loving boy. "I know this was a tragic situation but it does not reflect who Louis was. He was such a loving child, adored by all his family and friends. "He lived life to the full. A great sportsman. So effervescent. We will remember him for the boy he was. He was just such an amazing, loving son."